This is the Scholar's Edition: accept no substitute. You will treasure this volume. Hardback with beautiful cover designed for extreme use and durability. 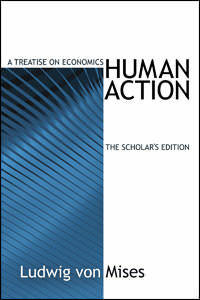 For a Human Action glossary try Mises Made Easier by Percy Greaves. You will need a bit of prior knowledge in philosophy, logic, and of course economics among other things before being able to get a complete understanding of this book, but if you're a curious intellectual, let this be your introduction to Praxeology. If you want something a bit less difficult or time consuming, Henry Hazlitt's Economics in One Lesson is a great place to start, and I've heard that Murray Rothbard's Man, Economy, and State is an easier read than Human Action, but while I can personally vouch for the former, I have no experience with the latter. I read this book for a class in school, actually thats pretty much all we did, for the whole semester of class, but we all finished the book. It may have been hard to understand at times, it is a scholar's treatise on economics after all, but it is a book truly worth the effort to read. from Millersville Read This Book! At first, Mises spends what seems to be an inordinate amount of time explaining and defending what would appear to be simple common sense logic. Eventually, it becomes apparent why this is necessary; modern economics, outside of the Austrian School, spends most of its time trying to obfuscate and deny simple common sense logic. I pressed through these chapters and I'm glad that I did. The initial sections set the stage for the type of reasoning that would be necessary to follow the rest of the book. This book filled a lot of the holes in my understanding of Austrian Economics. I kept finding myself chuckling aloud when, on page after page, Mises would make yet another brilliant and irrefutable point against statism and socialism, often blasting away common assumptions which are rarely, if ever, questioned by society at large. I was most impressed by his theory on the problems of economic calculation in socialism. The book was a tough read, but definitely worth it! from Cape Town So far so FANTASTIC !! I got my copy along with many other things sent all the way to cape town, south africa. It arrived last week and I'm about 1/4 of the way through it. I have always enjoyed "intellectual" books, but never have I had one that has made me stop and think about what I have just read so often. This actual copy is of really high quality and I would say $20 is super cheep even if you paying in SA Rands. Thanks for the great book and service. Show your support for Austrian economics with this bold new shirt! A book you can recommend to anyone as an undaunting introduction to the economics of Ludwig von Mises.